Ngugi wa Thiong'o unveils his first Gikuyu epic. 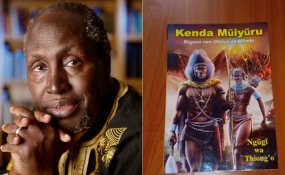 Renown author Prof Ngugi wa Thiong'o has released his 34th novel, a Gikuyu epic titled Kenda Muiyuru: Rugano rwa Gikuyu na Mumbi (loosely translates to perfect nine: the story of Gikuyu na Mumbi). The book was launched at the Kenya National theatre on Monday, February 11. "I am currently reading the Kikamba Bible which was translated from Greek by Professor John Mbiti. There is something profound about the mother-tongue. At the judiciary, there is what we call Alternative Justice Systems where people settle issues in the hearing of elders or religious leaders. This method enjoys a lot of support from people and is especially esteemed because of the use of local language. Parties involved have more confidence in getting justice served when the issue is deliberated in a language that can be understood by all," said Dr Mutunga. "When writing this novel, I focused on the myth of Gikuyu and Mumbi, and their daughters. Contrary to most claims about the tradition of marriage, Gikuyu had only one wife and was therefore monogamous." "I thought about Gikuyu's daughters and how they had to do all the work since they did not have any brothers. They did not depend on men to fend for them because the men were simply not there. I like to think of them as the original feminists. I wanted to tell a different story of our matriarchs. A story of brave, witty and heroic women and simply allow these qualities define the clans. This is my first Gikuyu epic and I hope that you will all grab a copy and enjoy reading it," Ngugi said amidst the applause from the audience. "Prof grasps people's reality in such a refreshing manner that makes him a brilliant writer. He sent me the drafts of Kenda Muiyuru and my initial reaction was on how the character of Mumbi was being depicted, especially from a gender perspective. We discussed this at length. I also offered insights on the ogre stories, most of which I borrowed from Wanjiru wa Rukenye's books. I was very humbled to read his work and give comments. Ngugi is the kind of person who appreciates everything you do, every effort you make. He is such a gifted writer and that is why we keep asking when he will get the Nobel Prize in literature because he has surely earned it," said Prof Wanjiku. "Sometime back I had this desire to create a Gikuyu e-book with illustrations for children to learn the basics of our language. Around the same time, I bumped into a friend, Mr Nyoro who was my boss back when I used to work at Oxford University Press. He gave me a book saying that they were doing a project on the African culture. When I opened the book, I saw it was written in Gikuyu and I immediately connected with it. Later, Mr Nyoro then introduced me to Ngugi we hit it off immediately. He was so warm and charismatic which really motivated me once I begun sketching the illustrations," said Julius. "When I look at this book, it makes me so happy because people are proud of how it came out and proud of the effort I put into it. Ngugi loved it so much and for me, that was very rewarding." said Julius. On February 21, the world will be marking 'Mother-tongue Day' and to celebrate this observance, a delegation from East African Educational Publishers (EAEP), the publishers of Ngugi's epic novel, will be unveiling Kikamba textbooks in Kitui at Kenyatta University Kitui Campus. Kenda Muiyuru by Prof Ngugi wa Thiong'o is now available at the local bookstores and is retailing at Sh700 per copy.